If you’re building a successful business, at some point, a client or customer is going to reject you. A client might stop hiring you. A customer might return a product. When this happens, you’ll experience a little “ouch” and may begin to second guess your abilities. However, rejection isn’t the end of the world or of your business. In fact, you could argue that if you never experience rejection, you're not building your business well enough. All successful entrepreneurs have had someone fire them or say no. The key is to not let it stop you from continuing to build your business. Here are tips to dealing with rejection in your home business. Clients and customers reject businesses for many reasons, and in some cases, it's about you. A client might be having financial difficulties and not be able to afford you. Or maybe his needs have changed and they don’t include services or products that you offer. With that said, the rejection may be because they’re unhappy with your service and products. Learning why you’re being rejected can give you the opportunity to fix it to retain the business, or, at the very least, decide if you need to make changes to insure it doesn’t happen again. This is where having regular feedback surveys can help you avoid losing clients and customers. Even if clients or customers have rejected your service or product because they don’t like it, that doesn’t mean they don’t like you. Rejection and criticism in home business is about your business and not a reflection of you as a person, assuming you’re providing quality products and services, and customer support. Getting fired or criticized either deflates or angers most people. The response is often to want to quit or defend yourself. If you can separate the rejection of the business from you as a person, it will be easier to be objective and manage emotions. The first response to getting fired or rejected is often to fight back, but you can’t do that as it can only hurt your business. Run your business with the motto, “Kill them with kindness.” I can’t tell you how many apologies I’ve received after getting a mean, nasty, often derogatory email that I responded to professionally. I expressed concern, made apologies, and offered to help, and the complainer usually feels bad about being a jerk (if they don’t, I don’t want to work with them anyway!). In today’s world with social media and review sites, you can’t afford to be mean, snarky and nasty, even if the client or customer deserves it. Instead, you need to remain professional, offering to fix or help with the situation, or perhaps suggest an alternative resource. Even if you don’t get an apology, you can know you took the high road and are the better person. While some clients and customers are unreasonable or difficult, in which case you probably don’t want to work with them anyway, sometimes their rejection of you has merit. You need to listen to their reasons and consider it feedback on how you can improve your business. Is your service too slow or not up to their expectations? Is the order process hard or the product not working. These are areas you can improve. An interesting tidbit about human nature is that we tend to put a lot of focus and weight on one bad comment or review, and not enough on all the good feedback and praise. 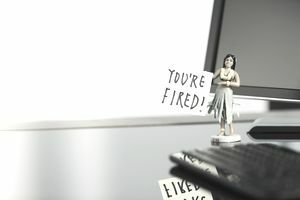 While you certainly want to consider what's behind getting fired or a 'no,' you should also relish in the positive comments your clients give you. Even your best, most loyal clients and customers will go away someday. There is an ebb and flow to your business, as well as to your clients’ and customers’ needs. Losing a client or customer can be stressful and scary, but if you’re marketing and always looking for referrals, you should be able to replace lost business with new business. Not day should go by that you haven’t done something to expose your business to your target market, such as blogging, social media, advertising or asking for referrals. It might seem strange to network with a client that fires you, but depending on the reason for being let go, the client might be willing to soften the blow by giving you a referral. So unless the client is unhappy with your work, consider asking if he knows anyone else that needs your services or products.